It’s a blessing because with that many people using the business-oriented social network, recruiters are prowling the site to find job candidates. LinkedIn makes over 60% of its revenue on recruiter tools, the company says. It’s a curse because with 400 million profiles on the site, it can be tough to make yourself stand out from the pack. The best way for recruiters to find you is if your profile pops up when they search for job candidates. Here’s a tip for surfacing your profile in those searches, from LinkedIn spokesperson May Chow. 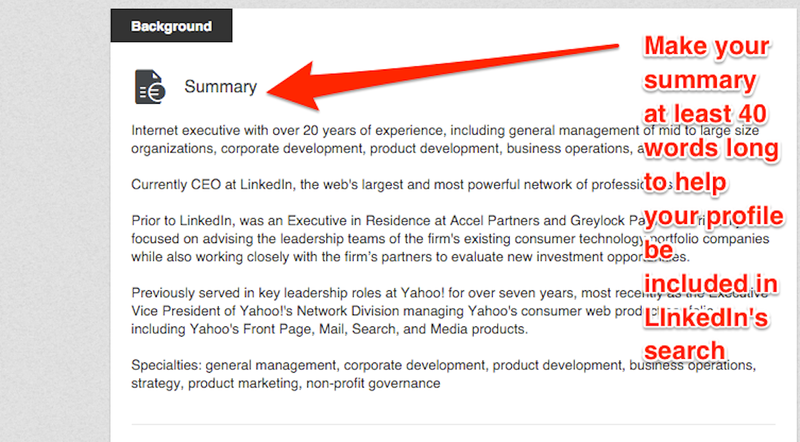 Fill in the section of your profile called “Summary” and make it at least 40 words long. Summaries shorter than 40 words will not trigger inclusion in a search, she says. “Having a profile with at least 40 words, means the profile can surface higher up in searches that include words that match words in a profile,” she explains.